We know that marketing your business can be a real pain in the neck if you don’t really know what you’re doing. But when you partner with us, like these chiropractic clinics have, we can relieve some of the stress and make it a little less painful. In January of 1999, Dr. Jeff opened Hillside Chiropractic to provide personalized chiropractic care to the Elk River, MN area. It’s Dr. Jeff’s personal mission to build the community he lives in one person and one active body at a time. Dr. Jeff specializes in ART, or Active Release Technique, a process that combines massage therapy, chiropractic care and physical therapy to help his clients restore mobility to their joints. Dr. Thompson started practicing in Cedar Rapids, IA but has since moved to a practice in Mesa, AZ. He has been a practicing chiropractor in Chandler, AZ since 2015. Dr. Thompson was voted one of America’s Best Chiropractors in 2017. Dr. Tom Lankering has been practicing bio-energetic chiropractic for 33 years and has hosted and produced a TV show called Healthy Lifestyles and has a YouTube channel called Lankering Chiropractic. Outside of alternative healing, Dr. Lankering loves to be out in nature hiking, biking and skiing and is also a passionate piano player. Dr. Ken Kilgore relocated to Cherokee County from Central Florida, where he was practicing until April 2006. In January of 2010, Real Health Solutions joined Ribley Chiropractic to better serve the Woodstock, GA area. When he’s not at the office, you can find Dr. Ken spending time with his family, playing with their Boxer, enjoying a walk, canoeing, mountain biking or just hanging out. 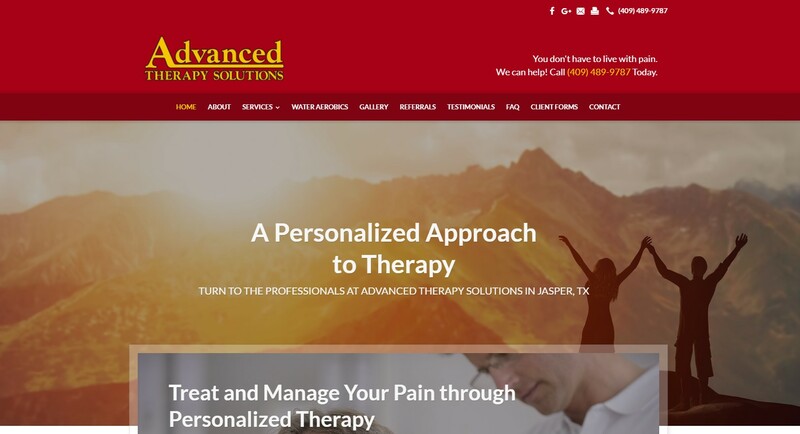 The professionals at Advanced Therapy Solutions provide physical, occupational, aquatic and speech therapy in Jasper, TX. They also offer instructed and non-instructed water aerobics classes to the general public. Bond Chiropractic Center is family-owned and operated in Frazer, PA. Since 1986, Dr. Stephen Bond has been known for doing after-hours, emergency and home sessions. He recently finished his Certificate in Clinical Nutrition and is a fellow in the International Academy of Clinical Acupuncture. Lance Loomis, DC has been treated by chiropractors since he was born. Dr. Loomis attributes his overall health to having been under chiropractic wellness care his entire life. He loves to teach his patients how incredible the design of the human body is, and he really gets excited when patients transform their perspective on health from reactive to proactive.